The program jointly lauched by UNCEF China and the Ministry of Education works on developing a framework for making rural China's public schools safe, happy, inclusive and participatory. It sponsors rooms, holds activities and sends outstanding teachers from top schools to teach after-school courses for migrant children, to promote their healthy growth and all-round development. Spring Bud Project, lauched by China Children and Teenagers' Fund, is a social welfare project to help dropout girls in poverty-stricken areas return to schools. Project Hope is a Chinese public service project aiming to bring schools into poverty-stricken rural areas of China, to help children whose families are too poor to afford elementary school education. Adream projects consist of four branch programs, Adream Center, Adream Course, Adream Coach and Adream Room. They aim to improve the imbalanced education system in China. An education support program focusing on helping children of poverty-stricken area (mainly Guizhou Province) to fulfill their dreams of getting proper education. 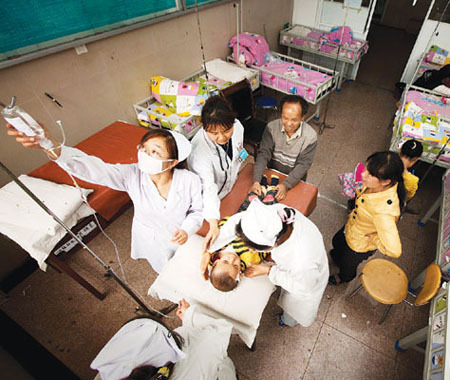 This program provides free surgical operations on Eye-Trains for poverty stricken cataract patients in the countryside of Mainland China, with the operational costs funded by public donations. This public charity action helps Chinese women with breast cancer hailing from particularly poor conditions receive timely medical treatment by funding operations for them. "Happy Smiles” is a charitable publicly beneficial program to help the impoverished children with cleft lip and palate syndrome have surgery for free through funds-raising. It aims to help impoverished mothers in family planning families across poor areas to improve their economic and social status. The project aims to establish Spring Sprout Kitchens and train kitchen administrations for boarding schools in mid-and-western China with high concentrations of left-behind children. A fund to raise money from society for schools in the poor area of China to provide free lunch for their students who are in a serious shortage on the nutritional intake. With gifts of livestock and agricultural training, Heifer China Program helps families in rural China improve their nutrition and generate income in sustainable ways. This program works on installation of solar hot water system in rural schools across Northwest China, improving the living conditions of boarding students without increasing schools’ financial burdens. As a new model of poverty alleviation, the Guangcai Program has united private entrepreneurs in the undertaking of eliminating poverty and achieving prosperity. The project is jointly lunched by WFP and CRI, aiming to draw people's attention to food saving in order to fight hunger and malnutrition which are still threatening many lives in some parts of the world.